The unique, fit-to-the-user, U-shaped pocket provides pressure elimination at the ulcer site, while allowing full ventilation through the open back. Sizing the pocket correctly puts maximum pressure on the femurs, removing the danger of the “donut-effect” inherent in one-size-fits all, circular cut-outs. Pocket should fit close to the ischials without touching them. Flat shelves for the femurs allow even distribution of body weight across the length and width of the load-tolerant femurs. They also help to control internal or external rotation of the femurs. The core of the Isch-Dish is made of layers of open-cell foam of varying densities and ILDs for support and longevity. Molded ABS plastic insert fills in the gap created by fabric slings. 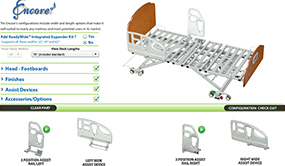 Creates a flat rigid foundation where needed. Included standard with every Isch-Dish. Since 1989, the Isch-Dish® has been the most direct seating solution for those with, or at high risk for pressure ulcers at the ischium or coccyx. Unlike other products that merely equalize pressures across the seating surface, the unique, open pocket design of the Isch-Dish® actually eliminates pressure at the ulcer site while ventilating heat and moisture. Caregiver selects the appropriate standard small, medium, or large pocket size based on a simple measurement of the ischial span. Documented as an important complement to any wound treatment, and for long term prevention. Promotes healthful, upright posture by controlling pelvic tilt. Reduces "sacral sitting" that can cause skin breakdown. Includes multi-tiered foam support core (see Tab 3 above) protected by Durafilm™ incontinence-proof coating, machine washable deluxe cover, removable Sling-Fill seat base, 2-year warranty. 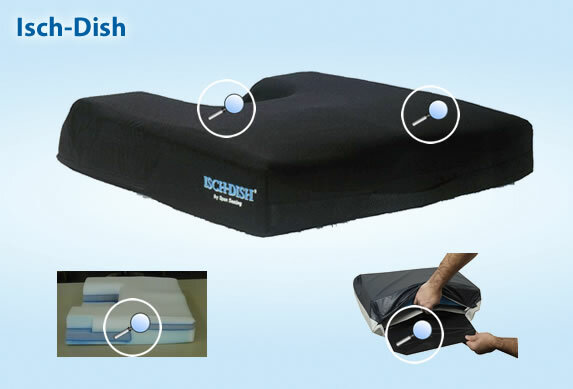 The ISCH-DISH® Cushion is recognized for reimbursement under Medicare codes E2607 (< 22” wide) or E2608 (>22” wide). Pressure relief, positioning, and pain relief for those not at high risk for pressure ulcers. A full 1.25" lower than the standard Isch-Dish. Caregiver selects the appropriate standard small, medium, or large pocket size based on a simple measurement of the ischial span. Great for sensate users, including stroke and geriatric patients, and for those with chronic sitting pain due to injury or illness. Ideal for hemi-chairs, office chairs, and car seats. Preferred by active users in lightweight wheelchairs. Includes support core protected by Durafilm™ incontinence-proof coating, machine washable cover, removable Sling-Fill seat base, 2-year warranty. 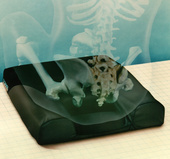 The ISCH-DISH® Thin Cushion is recognized for reimbursement under Medicare codes E2605 (<22” wide) or E2606 (>22” wide).